Most realistic training baton on the market today. 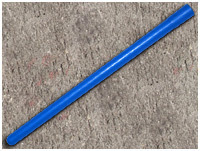 Easy to install, cost effective striking tip replacement (only $9.99 – ST-BBRT) to guarantee years of use for as long as you own your Blue Baton. 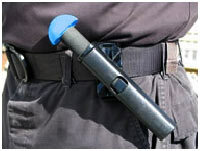 Blue Baton facilitates the use of two different end caps should the officer currently use a mushroom-shaped (Hindi Style) or regular based end cap. Blue Baton allows the officer to select the baton and actually employ the same motor skills and negative time framing (accessing, drawing, extending, striking) that an officer would in the field. It also builds effective "mind maps" from repetition of proper technique. Reality Based Training has never been so real! For a more in-depth look, check out the Blue Baton website. Great for Baton Practice Techniques! "I've been teaching in the Reality Based Training realm for most of my adult life, and every now and then a new technology emerges that fills a void that helps us train more realistically. 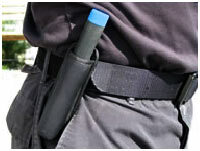 If your officers utilize collapsible batons in an operational setting, these training batons are a "must have". I heartily endorse this product." Click HERE to read Ken's full testimonial. All RBT participants should wear proper protection in scenarios. Go to www.bluebaton.ca for more information. Note: Although Blue Baton only weighs approximately 90 grams (3.5 oz.) it can still cause injury (stinging/bruising) if struck against unpadded areas on a role player. The best protection for the hands is boxing type gloves (as opposed to open fingered gloves) as well as inner and outer forearm/upper arm protection. The same type of padding should be worn for legs. Use only certified quality padded training gear. Headgear and eyewear must also be worn in conjunction with RBT. Please check with your agency subject matter experts (certified reality based instructors) before using Blue Baton to strike role players.